OK, As I mentioned elsewhere, I have acquired luffa/loofah seeds. Long fruited and most likely late maturing variety. I've coaxed some of the seeds out of the entire fruit dried fibre/sponges and tried dropping about two dozen in some luke warm coffee. I had four immediate sinkers, so we're good to go. The plastic pudding cup of warm coffee and seeds are sitting on top of the T-5 light fixture for now. I'll soak them for about four hours and then plant them (or proceed with a pre-germinating method). At the moment, I'm thinking of planting them in individual micro-greenhouse/ made from 1 gal plastic vinegar jugs. Last time, I planted them in 1 qt plastic containers and they got a little tight. Cut off 1 gal jugs should make approx 1/2 gal (2 qt) as well as the dome to keep them warmer. If anyone else is growing loofah (I decided I like this spelling better ) this year and want to join in journaling their process, please do. We could compare notes. ...and besides, I have a lot to learn and need to pick your brains. 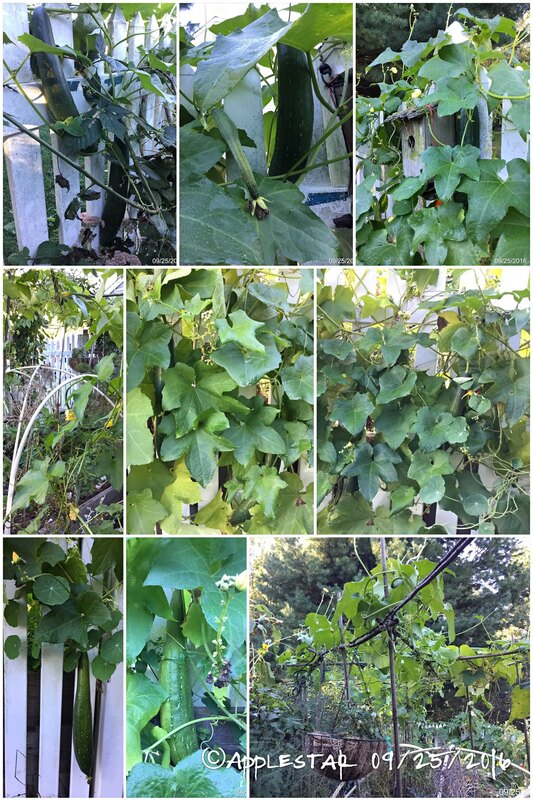 For information on how to grow, check out this thread: Advice growing loofah / luffa where there have been lots of good info posted already and where I'm trying to consolidate links of previous threads. Do squash bugs and squash vine borers bother them? If so, I won't even try. Not SVB's I think, but most likely squash bugs, stink bugs, and harlequin bugs as well as cucumber beetles. Last time, I had a house wren family living in a nest box behind the trellis and three praying mantis ootheca had been deposited the pervious autumn.... And this was the area that always end up with giant brown garden spider and black and yellow garden spider orbs by fall. -- all despite best efforts by the house wrens. Heh, heh, by three o'clock when I had planned to sow the seeds, I had about ten complete sinkers and ten semi-sinking bobbers. Only four floaters.... I sowed twelve in six 2" mini soilblocks -- 2 @, and rolled up the rest of the bobbers in moist paper towel pre-germination method. I used warm water for the paper towels and set the miniblock tray in warm water in the sink to warm up. They have been tucked in between and under the tomato and flower seed germinating trays on the heat mat. Well, last year was a bust -- one or two seeds may have tried to grow but died. 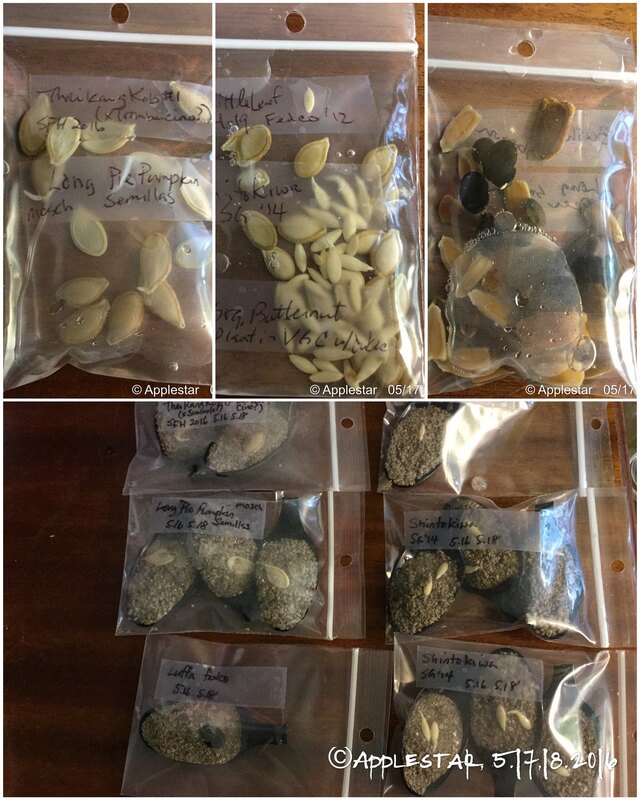 This year, I tried the saved seeds from last year as well as purchased seeds from Fedco, and used the aquarium heater maintained incubation chamber. The saved seeds did not germinate,mbut the Fedco seeds went bonkers! applestar wrote: One of my NEW EXPERIMENTS this year will be trying different ideas for DIY SWC (Self Watering Container) and SIP (Sub-irrigated Planter). I've been looking at different designs and plans on-line for a while now. I want to stick with something simple that I can make easily, hopefully with minimum need to purchase supplies. For starters, I made these from recycled 2L soda bottles and drinking straws. I made the two for Dwarf Orange Pixie tomato seedlings a while ago, but it had been worrying me that there was no vent/drainage hole for the water reservoir. It has been my observation that most of the recent designs provide for an air space between the soil and the water surface in the reservoir. Today, while I was making two more containers for the sprouted/germinated luffa seeds, I had an moment when a portion of the sidewall kept buckling inward. I punched poles on opposite sides of the outer reservoir container, then aligned the buckled part of the inner container with the hole, then pushed a straw in the gap so the bottom of the straw is in the airspace above the water. It was an easy retrofit to make for the tomato containers as well. Now there is a ventilation/watering tube. I'm not worried about drainage hole for these since they will be indoors and watering will be strictly monitored. Luffa containers needed a humidity cover, and it turns out the quart size zip bag (also previously used) fits perfectly, and all I had to do was cut the corner off to let the straw out. Once the luffa seeds sprout, I'll cut off the other corner for better ventilation. ...I started the seeds extra early because it seemed like they took forever to germinate. Now I'm in trouble because they are starting to vine already and getting way too big. Applestar - can you move them to a larger container until it is warm enough to plant out doors? BTW - your orchids are stunning. I have toyed with the idea of planting Loofas and Gourds but never did so because of space restrictions. I have friends who live on "in the country" and have lots of room for large vining plants. Mostly along fence lines. They do not jump through hoops to germinate seeds. A soak in warm water then toss them on some tilled ground. They grow like weeds. Amazing how much difference climate makes. I am interested in your progress. I tried loofah two years ago, just threw them in the ground and they didn't germinate for me but I was using traded seed and did not do a germination test. If I did it again, I would probably grow starts since our season here is so short. First male blossom opened yesterday. I hand pollinated two of these. Didn't see the third one in time. I noticed one more HIGH up on the trellis yesterday. It looked like it had opened the day before (and too high to reach) so I hope some pollinators took care of that one. They are growing on a trellis a foot away from the wall in the house/garage South corner nook so hopefully they will be protected from the cold and earliest frost and keep going a little while longer. The corner location doesn't get the best sun exposure, but by climbing high up, they are managing to catch some rays that don't reach all the way to the ground. One is *almost* mature enough, the other one is probably not. But they are hanging in the house in hopes of getting them to develop a bit more.... 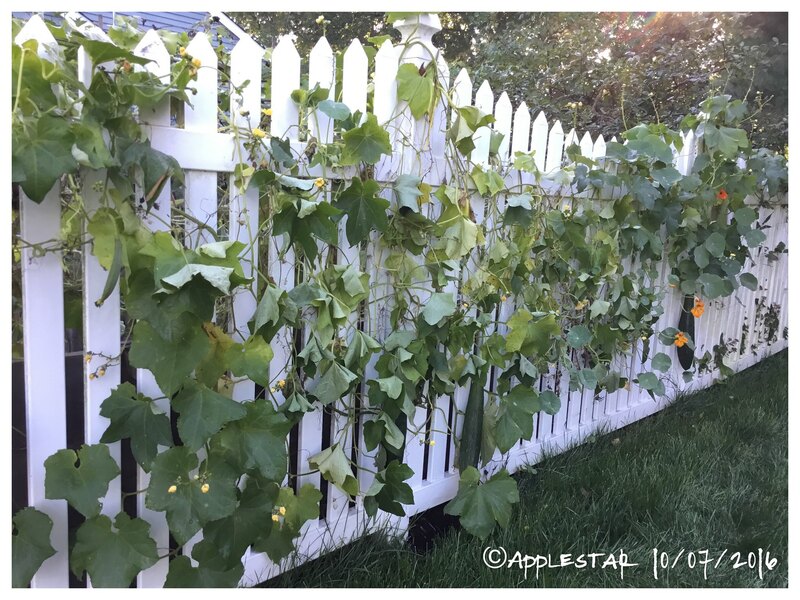 Here are the rest of the fruits growing strong on the fence. ...did I mention I only just soaked them last night? I'm only spoon-zipping them temporarily (I think) -- I did successfully SPOONZIP and grow them last year, so I might just keep them in these until they sprout with seed leaves, then plant if weather is favorable. If not, they will go in 16 oz - 20 oz cups with plenty of room for their roots. I was hesitant about harvesting and eating the younger fruits that most likely won't mature completely for making sponges or saving viable seeds because I had not mentioned eating them in this thread and these are obviously not the *angled* luffah (Chinese Okra) that are often mentioned for cooking. With the freeze last night, the Luffah might be done for. I left four largest that are growing from vines on the trellis along the house wall and draped in front of them with double layers of floating cover and tarp.. But looking out the window, it looks as if the one upper corner of the second layer got loose -- haven't gone out today so I'm not sure. A young, uncovered vine that was crawling across the window, and vines that were growing in exposed areas look wilted/dead though. I harvested the rest yesterday -- one medium and two smallish fruits -- and added them to a stir fry last night with cabbage and green peppers, onions, garlic, myoga, miso, and peanut butter. Very yummy served with rice. Yesterday morning, official pre-dawn temp went down to 45°F. When I went to check on the luffah on the neighbor's side of the fence, there were a whole bunch of leaves that had blackened -- they looked like they had been hit by frost. Here is a photo I took after removing all the blackened and worst of the yellowed/browned leaves. If I wasn't eating them, what to do with the not quite mature luffah.... then I came across instructions for processing luffah that are still green yet sufficiently matured for sponges but not for seeds. (This one is in Japanese -- use Chrome or other browser that will translate for you if you need the words, but the pictures explain most of the process.) Most of this type of instructions say to boil for few minutes to 20 minutes until the thick skin and flesh come off easily. Obviously boiling would kill the seeds even if any of them are mature enough to grow. But usually, the seeds shown are white and immature like these. I tried with my immature fruits and one not quite mature medium-large fruit (previously harvested or fallen). 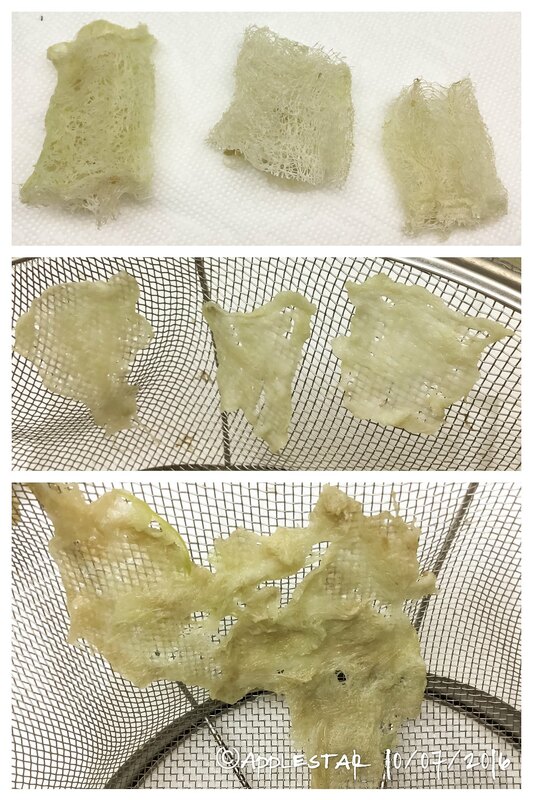 Most of them were completely useless for sponges as I suspected but produced some soft fibers. don't know if there are any use for them, but I'm drying them. Apparently, you can get softer, not as coarse sponges from not quite completely mature fruits which some people say are better for skin care than the rough, hard fibers of the fully mature fruits which are better relegated to kitchen and other scrubbing/cleaning duty. "Starting to yellow" seem to be the key level of maturity -- my one almost mature fruit that yielded those sponges still had the really soft fibers near the stem end. 2014 countdown. What are you growing?